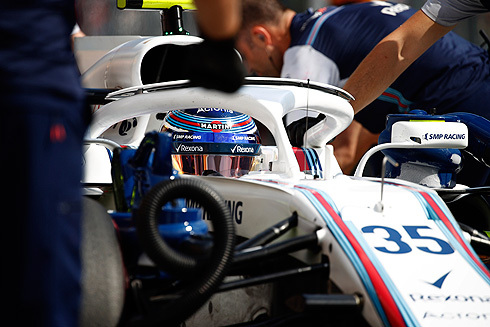 The second Friday practice for the 2018 Hungarian GP would see the Williams Martini team again face a difficult session with both drivers finishing well down the times. 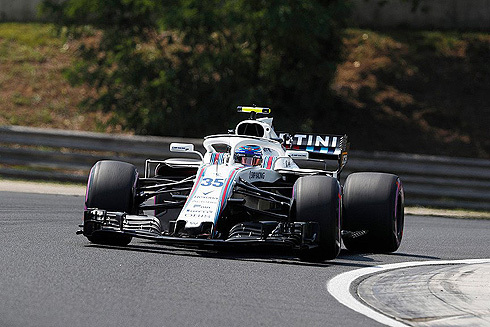 Lance Stroll would finish ahead of his team-mate Sergey Sirotkin with the pair 18th and 20th. Despite this the team was pleased by the work that they were able to get through as they still try to get to grips with the updates that they have brought to the FW41. The team is hoping to see an improvement on Saturday. The second practice session for the 2018 Hungarian Grand Prix would get underway with the Hass cars out first. With the first times been set we had a Williams fastest followed by Grosjean and Magnussen. Both Ferrari and Mercedes cars were also out. As others went quicker it would be Vettel, soft tyre, going quickest with a 1m:18.997 but Hamilton and Bottas would move ahead with Hamilton fastest with a 1m:17.875 using the soft tyre. Vettel was now third followed by Grosjean, Raikkonen and Magnussen. The Williams drivers were on split tyre evaluations using the soft and medium tyres. A 1m:17.868 would see Bottas now quickest from Hamilton and now Ricciardo. But Hamilton would also improve with a 1m:17.587 to again be quickest with Verstappen now second. Vettel and Raikkonen were fifth and sixth. After their first runs the Williams drivers were in 15th and 17th. At the front Verstappen would go quickest with a 1m:17.509 followed by Hamilton and Bottas. Ricciardo was fourth but he would improve to go second behind Verstappen. The top four cars were all on the soft tyre. 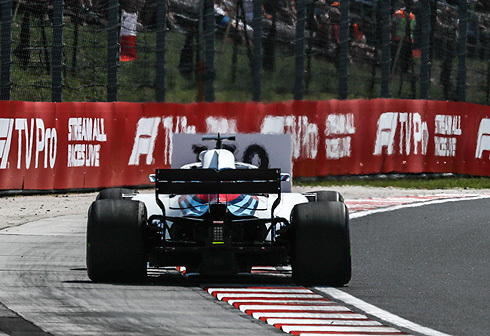 As the Williams drivers returned for runs on the ultrasoft tyre they were currently 17th and 19th. Vettel was on a quick lap with the ultrasoft tyre and would set a 1m:16.834 to go fastest. Ericsson was now seventh using the ultrasoft tyre. Gasly and Hartley using the ultrasoft tyre would improve to be ninth and tenth. Leclerc would improve to be tenth but would drop to 11th as Sainz moved up to sixth. Gasly was now seventh followed by Ocon and Raikkonen. Both Red Bull cars were out on the ultrasoft tyres as Raikkonen moved into third. With forty five minutes remaining the order was Vettel, Verstappen, Ricciardo, Raikkonen, Hamilton, Bottas, Grosjean, Sainz, Gasly and Ocon tenth. The Williams drivers had dropped to 18th and 20th. All the times for all twenty cars had been set on the ultrasoft tyre. The field were all out doing race simulations with the majority of drivers on the ultrasoft tyre. The Williams drivers were on split tyre evaluations using the soft and medium tyre. Both Mercedes drivers had switched from the ultrasoft tyre to the soft. With drivers switching to different tyre types as the session continued with all three tyre types been used the session would come to an end. Lance would be out first for Williams running on the soft tyre. Lance would set a1m:20.511 to be quickest. Lance would improve with a 1m:20.506 to currently be sixth. He would drop to ninth with a time of 1m:20.211 as he continued to lap on the soft tyre. Lance would drop to 15th and would pit after a ten lap run. Lance would return for a run on new ultrasoft tyres, currently 17th. Lance was able to set a 1m:19.831 to be 12th. He would drop to 13th with just under an hour remaining. Lance would pit after a seven lap run currently 16th. He would return still on the used ultrasoft tyre currently 18th and would set a 1m:19.645 to remain 18th. Lance would continue on his long run and with the end of the session he would complete twenty nine laps. Sergey would come out but he was on the medium tyre for his first run. Sergey would set a 1m:21.656 to be twelfth. He would drop to 15th. An improved 1m:21.276 from Sergey still on the medium tyre. Sergey would pit after an eleven lap run currently 17th. Sergey would also return using the ultrasoft tyre currently 19th. A 1m:20.272 and Sergey would remain 19th. Sergey would also pit after a seven lap run. Sergey would join his team-mate for a further run staying on used medium tyres. His best lap time was a 1m:19.770 which would see him remain 20th. On the medium tyre Sergey would continue to lap and with the end of the session he would complete thirty one laps.